But as it is, Christ has risen from the dead, the first–fruits of those who have fallen asleep (I Cor. XV:20). The great "three days of death", triduum mortis, were the mysterious days of the Resurrection. As it is explained in the Synaxarion of that day: "On Great and Holy Saturday do we celebrate the divine — bodily burial of Our Lord and Saviour Jesus Christ and His descent into Hades, by which, being called from corruption, our race passed to life eternal. This was not merely the eve of salvation. It was already the very day of salvation. "This is the blessed Sabbath, this is the day of rest, whereon the only Begotten Son of God has, rested from all His deeds" (Matins of Good Saturday). In His flesh the Lord is resting in the grave, and His flesh is not abandoned by his Divinity. "Though Thy Temple was destroyed in the hour of the Passion, yet even then one was the Hypostasis of Thy Divinity and Thy flesh" (Matins of Good Saturday, Canon, 6th canticle, 1st troparion; the canon is by Cosmas of Maioum). The Lord’s flesh does not therefore suffer corruption, for it abides in the very bosom of the Life, in the Hypostasis of the Word, Who is Life. And in this incorruption the Body has been transfigured into a state of glory. The body of humiliation has been buried, and the body of the glory rose from the grave. In the death of Jesus the powerlessness of death over Him was revealed. In the fullness of His human nature Our Lord was mortal. And He actually died. Yet death did not hold Him. "It was not possible that He should be holden of it" (Acts II:24) As St. John Chrysostom puts it, "death itself in holding Him pangs as in travail, and was sore beset..., and He so rose as never to die" (in Acta, hom. VII; cf. the Consecration — Prayer in the Liturgy of St. Basil). He is Life Everlasting, and by the very fact of His death He destroys death. His very descent into Hades, into the realm of death, is the mighty manifestation of Life. By the descent into Hades He, as it were, quickens death itself. In the first Adam the inherent potentiality of death by disobedience and fall was actualized and disclosed. In the second Adam the potentiality of immortality by obedience was sublimated and actualized into the impossibility of death "for as in Adam all die, even so in Christ shall all be made alive" (I Cor. XV:2). The whole fabric of human nature in Christ proved to be stable and strong. The disembodiment of the soul was not consummated into a rupture. Even in common death of man, as St. Gregory of Nyssa pointed out, the separation of soul and body is never absolute: a certain connection is still there. In the death of Christ this connection proved to be not only a "connection of knowledge": His soul never ceased to be the "vital power" of the body. Thus this death in all its reality, as a true separation and disembodiment, was rather like a sleep. "Then was man’s death shown to be but a sleep" as St. John of Damascus says (Office for the Burial of a Priest, Stikhira idiomela by St. John of Damascus). The reality of death is not yet abolished, but its powerlessness is revealed. The Lord really and truly died. But in His death in an eminent measure the "dynamis of the resurrection" was manifest, which is latent in every death. To His death the glorious simile of the corn of wheat can be applied to its full extent (John XII:24). In the body of the Incarnate One the interim between death and resurrection is foreshortened. "It is sown in dishonor: it is raised in glory: it is sown in weakness: it is raised in power; it is sown a natural body: it is raised a spiritual body" (I Cor. XV: 43–44). In the death of the Incarnate One this mysterious growth of the seed was consummated in three days: Triduum mortis. "He suffered not the temple of His body to remain long dead, but just having shown it dead by the contact of death, straightway raised it in the third day, and raised with it also the sigh of victory over death, that is, the incorruption and impassibility manifested in the body". In these words St. Athanasius brings forward the victorious and resurrecting character of the death of Christ (De Incarnatione, 26). 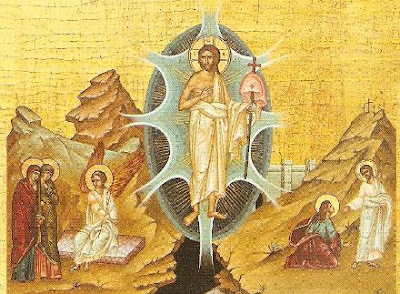 In this mysterious "triduum mortis", the body of Our Lord has been transfigured into a body of glory, and has been clothed in power and light. The seed matures. And the Lord rises from the dead, as a Bridegroom comes forth from the chamber. This was accomplished by the power of God, as also the General Resurrection will in the last day be accomplished by the power of God. And in the Resurrection the Incarnation is completed and consummated a victorious manifestation of Life within human nature, a grafting of immortality into the human composition. Source: Published by The Student Christian Association of Greece (Athens 1951).